The Island Poetographer VivaVoce: Freyas Day: Happy Friday & The Art of Giving Twice. Freyas Day: Happy Friday & The Art of Giving Twice. Here at Quail Hill, Nuvember has definitely decided to make itself known that it is a close cousin to Winter: our night time temperatures now go from minus 2 - minus 7. Knowing that this will wreck havoc on my hose nozzles (they really do not take freezing well) I REMEMBERED to bring them in as I do not want to spend money on something I could have saved from frost's destruction. I forgot to tell our house sitters to do that last winter and paid the price (pun!) for it this past gardening year. I love giving (and receiving!) handmade gifts and I really love the Japanese idea of giving 'twice' by wrapping the gift in something pretty and useable. 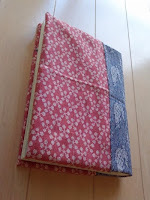 This style of gift wrapping in material is called 'furoshiki', a beautiful deceptively simple artform that is not only a joy to watch being folded but a joy to receive as well. If you go to my pinterest, I have collected a few images to share with you on there as well. Have fun. Blessings to all tapers, wrappers, paper hoarders (who me?) out there - you Know Who You Are!